What better way to forge a career than at SJU’s Career Development Center (CDC)? 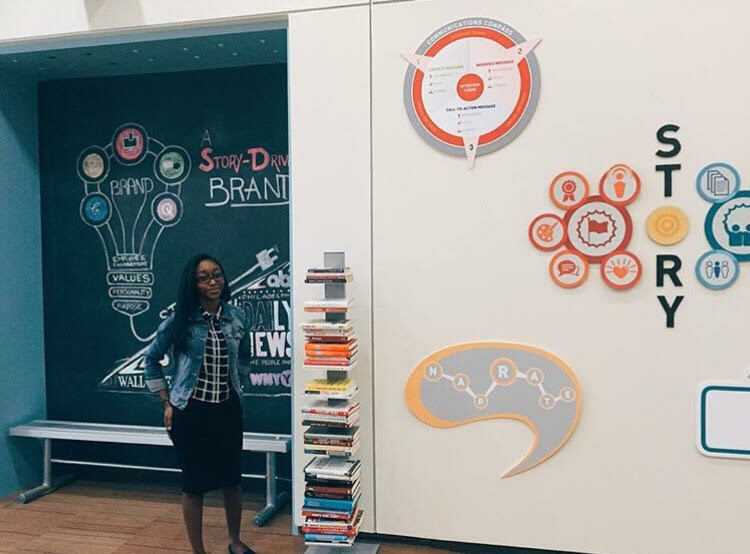 It’s where Kayla Lane ’17 is currently working as a Marketing Intern. Her advice for students is simple: when trying to reach your professional goals, make sure to shoot for the stars. Mid-semester during the spring of my junior year, I compiled a list of goals to be completed over the summer and throughout senior year. My main goal for the year, aside from securing a full-time job, was to obtain a paid internship that would aid in my professional development, contribute to my creative portfolio, and provide me with a different skill set. After successfully completing an internship off campus, I set my sights on an opportunity that was either on campus or close to campus to avoid the chaos of a busy morning commute. In the midst of securing a summer internship with the Office of University Communications, I came across the listing for a Marketing Intern at the Career Development Center on the SJU Careers website. After reading the description for the internship I realized that I was about a week away from the application submission deadline. Panic set in as I scrambled to find the right materials to submit with my resume. I was initially apprehensive as I was still in the early stage of developing my portfolio, so I didn’t have many clips or relative creative samples to send. Despite my initial nervousness, I submitted two different class projects that showcased the desired skills as well as my own creativity. Shortly after I received a call from Christina Felizzi, Career Counselor and Marketing Specialist, who would soon become my supervisor for the position. We spoke in depth about my experiences, the position and what would be required of me should I advance to the second round of interviews. I left the conversation not only feeling confident in my abilities but truly grateful that I had applied for the position, despite not having as much required experience in creating social media content. A few days later I was invited to the second round interview and the rest is history still being written. As the CDC’s Marketing Intern, I spend the majority of time scheduling social media posts, creating various promotion materials for the office’s events, taking over Instagram and Snapchat for event coverage, and engaging in whatever other creative pursuits are needed at the time. This experience has been incredibly eye-opening for me as I’ve been able to learn from a great supervisor. Working alongside Christina while also being able to work independently has helped me with my own time management and organizational skills. Being in such a warm and welcoming environment with the other Career Counselors has helped me to ask questions along the way, not only as an intern, but as a graduating senior looking for employment. Above all else, I’ve learned the importance of truly exploring my creativity. I’ve gained so much experience that I hope to take into the workforce within the next year. Every day I spend at the CDC reminds me of a chance I almost didn’t take due to a fear of being under-qualified and I’m so thankful that I pushed myself to go for it. As a graduating senior, I think its most important for students to go for opportunities even if you may not have all of the requirements or have completed every single prerequisite. If it feels right, shoot for the stars but also make sure you have a plan B in case you land on the moon! Kayla is a senior Communications and English double-major. A proud resident of Philadelphia, Pa, she is a commuter. As a Summer Scholar, she’s created a project titled “What Lies Beneath The Surface.” She hopes to secure a position in the communications/public relations field after graduation.